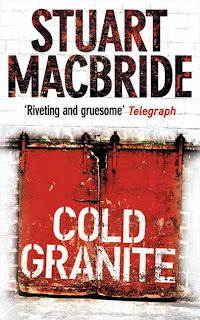 The title of this blog post is a new book I just started reading by Stuart MacBride. It's actually set in Aberdeen, which is pretty interesting and slightly funny. Better yet, some of the writing of people talking is "written" in their accents, like Aberdonian or Glasgowegian, which is pretty hard to do! "The wee shite's no gettin' banged up." It's a murder mystery, so not a light read, but I'm liking it so far. It's been a quiet day here so far. Mike went into the office for a few hours this morning and I've been catching up on writing. We're working pretty hard to get ready for our trip home, which is officially now less than a week away. I'm getting more excited every day! The rain and cloudy skies have persisted for awhile and I can't wait until we get some serious sun. We got a couple hours a few days ago but it also snowed at the same time, so just can't seem to get a clear day. I really don't know how the folks here handle this darkness every year, I think lots of 'em--including us--get pretty down in the dumps for awhile. It's no wonder the pubs are popular, they're the only entertainment once the sun goes down! Tonight we're looking forward to a fun time on Union Street with a group of friends, both Scots and Americans. Our American "family" has grown by one, a fellow engineer from the States moved to Aberdeen a few weeks ago. Tomorrow we'll be holding our own little Superbowl party thanks to Steve's slingbox. Apparently the game will also be aired on live TV here in Scotland as well! So we'll have a backup plan in case the slingbox doesn't pull through. The radio stations have also been talking football, American football, all day. A player from the 49ers was sharing tips about how we play the game and all the rules, it was weird to hear an American accent on the radio and I was totally caught off guard when they started saying "NFL!" I am assuming this Cold Granite is a library book....it would be neat to have a list of the authors to see if we can find any of the books here....I am making a note of this one! Good weather there for reading. Brenda has an insured from Wisconsin (similar climate to Scotland) and she said it is all they can do to drag themselves through the winter. It is hard on everyone I would imagine. Double hard on people like you who are used to a warmer climate in general. You will be home SOON!